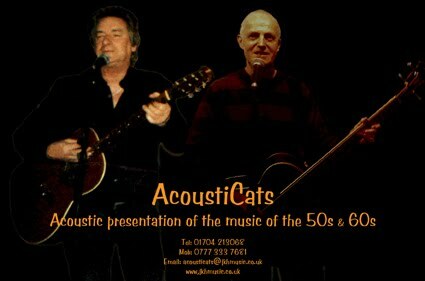 AcoustiCats; Acoustic Arrangements of the Music of the 50s 60s AcoustiCats are - guitar/vocalist; Keith Hubbard and bass guitar/vocalist; Stuart Lynch. Formed as an unplugged version of the Sounds of the 50s & 60s band ‘Shooter’ AcoustiCats performance is totally live, no backing tracks or supporting high tech. AcoustiCats repertoire features the big hit songs of pop music’s greatest eras in an acoustic professional presentation ideal for the small venue.